This week we went through the CSIA Level 1 course. We are both now officially qualified to be ski instructors. YEA! NonStop prepared us really well for the CSIA Level 1 course. The CSIA level 1 course span over three days and is based on continuous evaluation. You had to show an acceptable level of competency in your own skiing as well as teaching the basic of skiing. Although it was a little painful at times to be demonstrating a snowplow while fresh powder was calling, I am glad we persisted. We both had great course evaluators that help us not only improve our own skiing but also master the teaching aspect. As part of the course we got a copy of the Canadian Ski Teaching Manual. The manual covers all aspects of ski teaching; the way the Canadians believe it should be done, including guest services. A big part of a ski instructors job is to make sure the guests have a great time and come back in order to make the industry more viable. By applying these skills appropriately to skiing it creates three basic competencies: A centred and mobile stance, turning with the lower body and balance on the edges of the skis. Mobility. Getting guest familiar with the equipment and conditions. Including safely carrying the equipment. Sliding. Getting comfortable with sliding on the skis. Usually starting with one ski, then the other then on both skis. Stopping. Getting comfortable with stopping in a snowplow. Turning. Doing slow snowplow turns, first to one side and then to the other. Linking turns. Linking left and right turns together. Once a guest can link two turns they are ready to go up one of the chair lifts and get some mileage. They also need to be taught to get on and off the chairlift. We also worked through the 6 steps to for a great lesson: Assess the students, consider terrain, assess basic competencies, choose development tactics, evaluate progress and guided mileage. 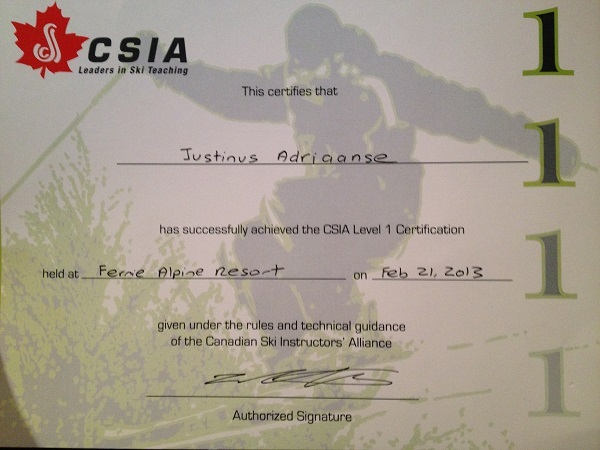 Proof that I passed CSIA level 1 – YEA! I can’t wait to teach my first class in a few weeks so I can put my newly acquired CSIA level 1 to use! 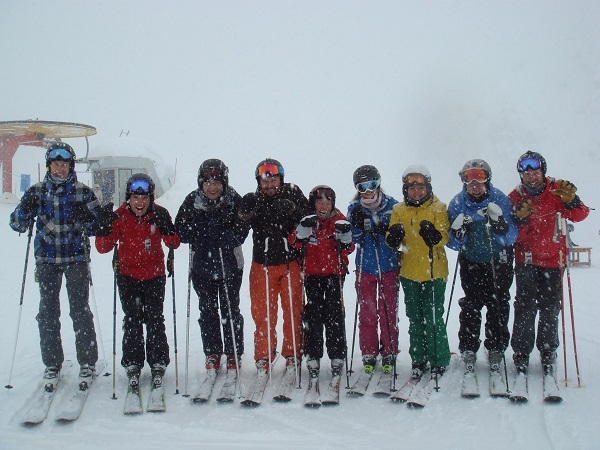 This entry was posted in Fernie, Nonstop Ski Instructors Course on 2013/02/26 by Justinus.